Stephen F. Austin State University undergraduate communications major Grace Linebarger's research paper titled "Global Media and Soft Power Representation: A Comparative Analysis of Indian Tourism as Experienced Personally and as Represented in The New York Times and Travel Channel" was accepted for presentation during the Southern States Communication Association Annual Conference. The conference will take place April 4 through 8 in Nashville, Tennessee. 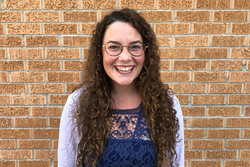 NACOGDOCHES, Texas - Grace Linebarger, a Stephen F. Austin State University undergraduate communication studies major from Flower Mound, learned her research paper has been accepted for presentation during the Southern States Communication Association Annual Conference to be held April 4 through 8 in Nashville, Tennessee. Her paper titled "Global Media and Soft Power Representation: A Comparative Analysis of Indian Tourism as Experienced Personally and as Represented in The New York Times and Travel Channel" discusses the different ways in which India is represented in various media settings. "There is this idea of 'soft power' in communication studies that expresses a nation or culture's unconscious influence," Linebarger said. "I wanted to see how India portrayed itself in comparison to how it was portrayed in the media." Linebarger traveled to India through a study abroad trip in spring 2017 with Dr. Sudeshna Roy, an SFA assistant professor in the Department of Languages, Cultures and Communication, and Dr. Aryendra Chakravartty, an SFA assistant professor of history. While in India, Linebarger quickly noticed that her expectations of India, which she had formed through media influence, greatly differed from her real-life experiences. When Linebarger began research for her independent study with Roy in fall 2017, Linebarger decided to focus on the disparity she had witnessed, which led to her research paper. "I put so many hours into this project, and it's amazing that I was selected from among so many other talented and hardworking scholars who submitted projects, as well," Linebarger said.